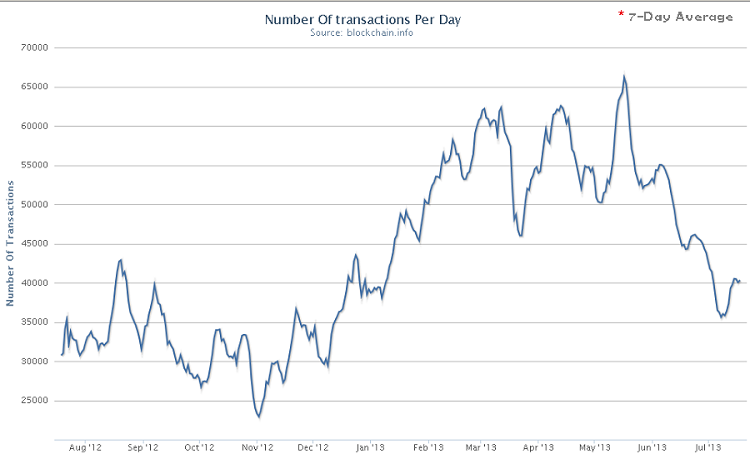 As Bitcoin has once again regained $100, where it is remained nearly all of Monday, there is now a rather curious decoupling of its usage growth and its price this summer. While it hit $104 on Friday before quickly falling back to $88, according to Mt. Gox, the $100 level has appeared to exert a magnetic pull in Monday trading, as it approached and pulled back from it dozens of times. However, as the price has rebounded in the past several days to the current $98.00, the move may be largely driven by speculators as the statistics measuring its usage have faltered. 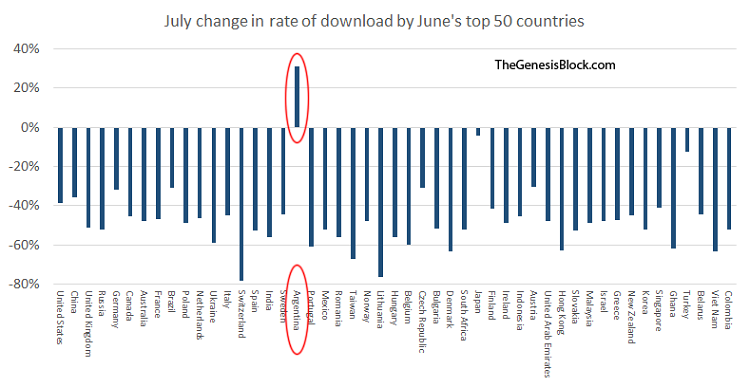 While Bitcoin continues to pick up coverage in major, reputable news outlets, only Argentina actually grew downloads in July of the Bitcoin QT client, according to the Genesis Block. However, Argentina is headed towards a “balance of payments crisis in slow motion”, as the WSJ reports, so it’s not too surprising that it is the sole nation bucking this summer downtrend. While growth in the usage of Bitcoin would ultimately drive it value, it’s not inconceivable that Argentina’s currency crisis is partially driving the quick rebound to $100, as many have speculated was the cause when Bitcoin first spiked from less than $1 to $30 in the summer of 2011.